After graduating with a BA(Hons) in 1993 I spent a few years working in self-employment on various commissioned site-specific projects alongside architects and planners. During this period I forged close links with a brick manufacturer and a concrete plant, both of whom not only provided me with workspace and access to materials but also very generously gave me the benefit of their vast technical expertise. Simultaneously, I was artist-in-residence in various schools in North Ayrshire as well as some in my own locality. While I was working on some of these projects I was in contact with the Construction Industry Training Board and various Further Education Colleges, one of whom asked me to set up a new course for them within their college which I did, and subsequently taught there for about twelve years having also gained a Post Graduate Teaching Qualification in Further Education. Sadly, with the current decline in ceramics (especially in the Higher Education sector in Scotland) the courses now on offer are in essence multidisciplinary and the ceramic element minimal if not entirely absent. 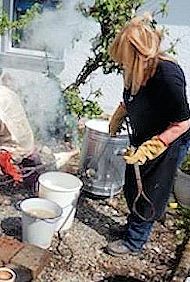 Consequently, I have decided to concentrate on my own artwork and also pass on my knowledge and expertise in ceramics and the ceramic processes to small groups in my own studio.